Antony Gormley writing, not this time about a new sculpture, but about his designs for ‘Sutra’, a Sadler’s Wells commission for Sidi Larbi Cherkaoui and the Shaolin Warrior Monks. This year, two out of three nominations for the Olivier Award for Outstanding Achievement in Dance went to visual designers – John MacFarlane for ‘Asphodel Meadows’ at the Royal Opera House, and Antony Gormley for ‘Sutra’ – who actually won it. While there have been mutterings in the dance world (and rightly so), that choreographers and dancers should have been among the nominees, it seems that, every now and again, the importance of design for performance as a visual artform falls into the spotlight. ‘Transformation and Revelation: UK Design for Performance’ is a major new exhibition of over 200 works for design for performance, outstandingly presented in brand new performance facilities at the Royal Welsh College of Music and Drama, and which headlines with Gormley’s designs for ‘Sutra’. 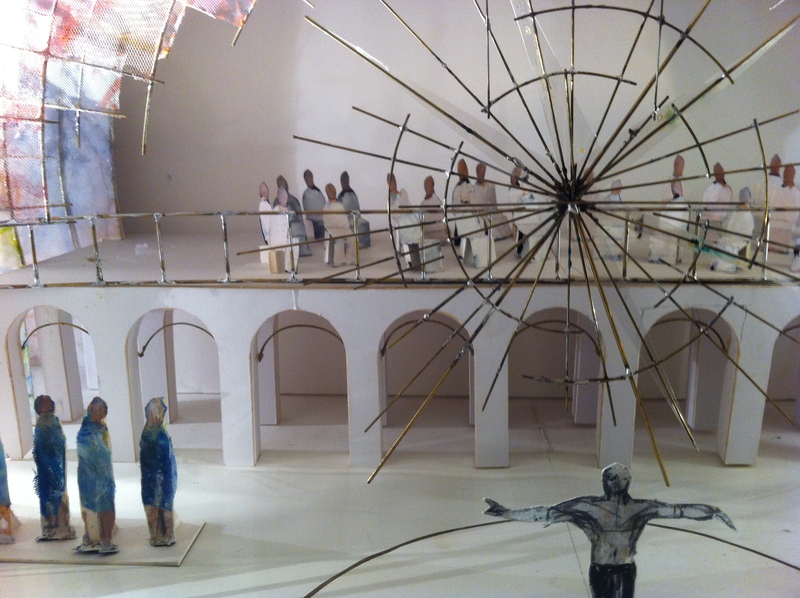 Unusually, visitors get to examine otherwise unseen work, such as Gormley’s stage plot for the show, and even stand inside the actual wooden boxes used in it. As exhibition curator Peter Farley says, “theatre design is not simply about clothes and scenery but is primarily concerned, as are other art practices, with the careful layering and interpretation of inspired visual and aural ideas”. 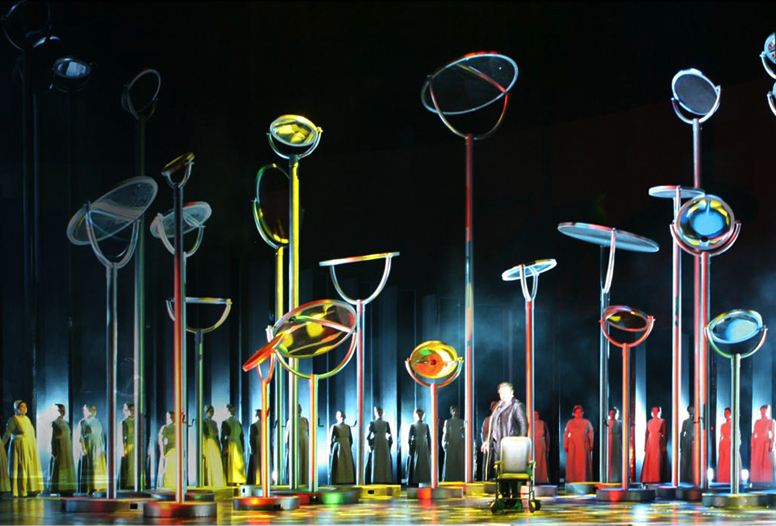 There is also the chance to see the work of less universally known but eminent artists in their field who express themselves through theatre design. John MacFarlane and Yolanda Sonnabend’s work, for example, has always been almost a form of painting. Other exhibiting designers working closer to other forms of design are ‘Lion King’ designer Richard Hudson, Paul Brown with his monumental designs for the lakeside opera festival at Bregenz, Bob Crowley who has just delighted London audiences with his designs for ‘Alice in Wonderland’ at the Royal Ballet and Es Devlin, a prolific designer, who is currently working on her design for the closing ceremony of the 2012 Olympics. Devlin is a superb colourist who has consistently paid homage to the world of art and architecture for reinterpretation and reinvention. 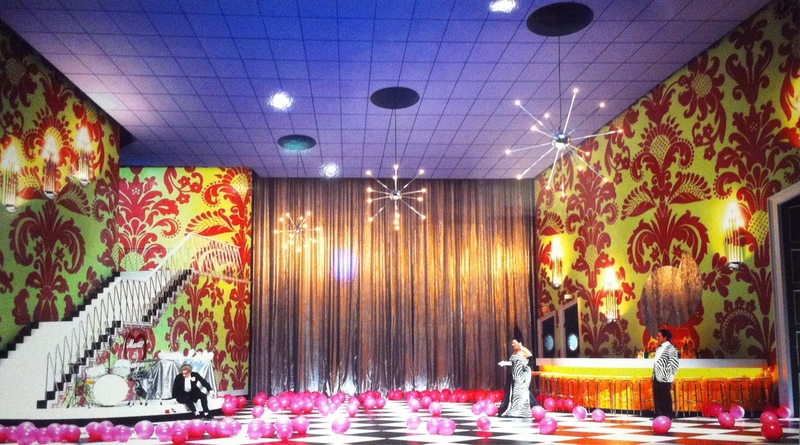 Famous examples of artists expressing themselves through stage design are of course Pablo Picasso and David Hockney. No painters on display this time (at least not live ones – although there is a fascinating presentation on de Chirico’s ‘Le Bal’ by V&A Research Fellow and costume expert Donatella Barbieri). However we do see exceptional designs by the architect John Pawson for the Royal Ballet’s ‘Chroma’ – choreographed by the it-boy of contemporary and classical dance, not to mention Radiohead music videos, Wayne McGregor. 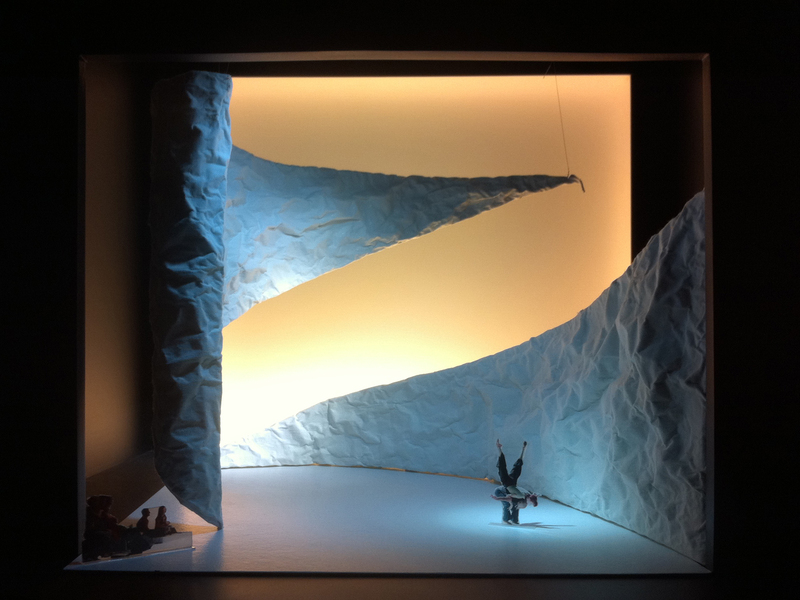 Dance lends itself to very pure forms of visual expression for stage designers. 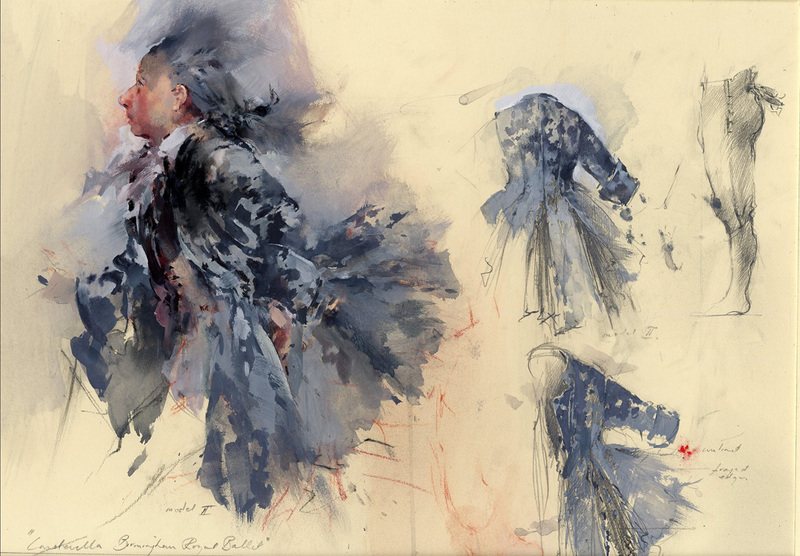 Just looking at the dance exhibits alone reveals a good many artists working in the field who produce images in the process of creating performance, which are stunning in their own right. Kimie Nakano, who trained in Paris fashion ateliers, brings with her profound knowledge of Japanese traditions. She presents her designs for Akram Khan’s ‘Vertical Road’ which have been seen at Sadler’s Wells as well as in Paris, Ottawa, Barcelona and Abu Dhabi. 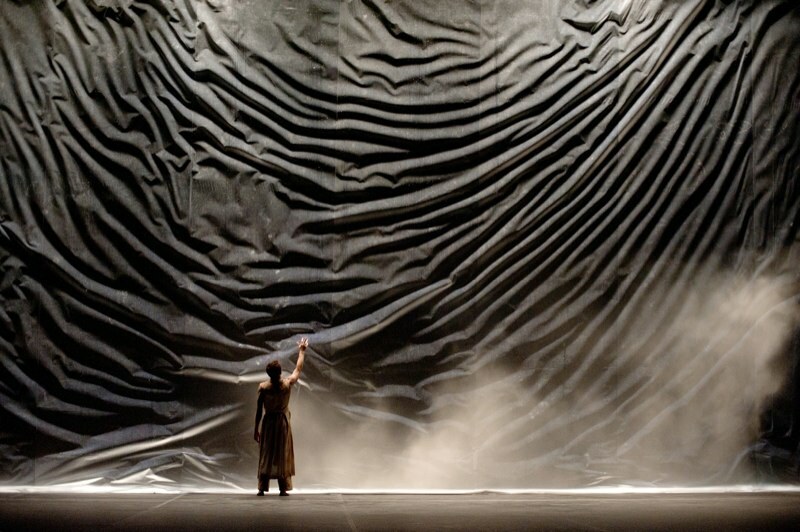 Shizuka Hariu is a scenographer and architect with a passion for dance and has designed Akram Khan’s ‘Sacred Monsters’, for Sadler’s Wells in London, also shown in Brussels, Paris, Sydney and Tokyo. With her architect’s enthusiasm for new materials, Hariu came up with the idea to use a new cotton/aluminium hybrid which made possible this design. Pippa Nissen is another architect, working across a broad range of performance mediums. 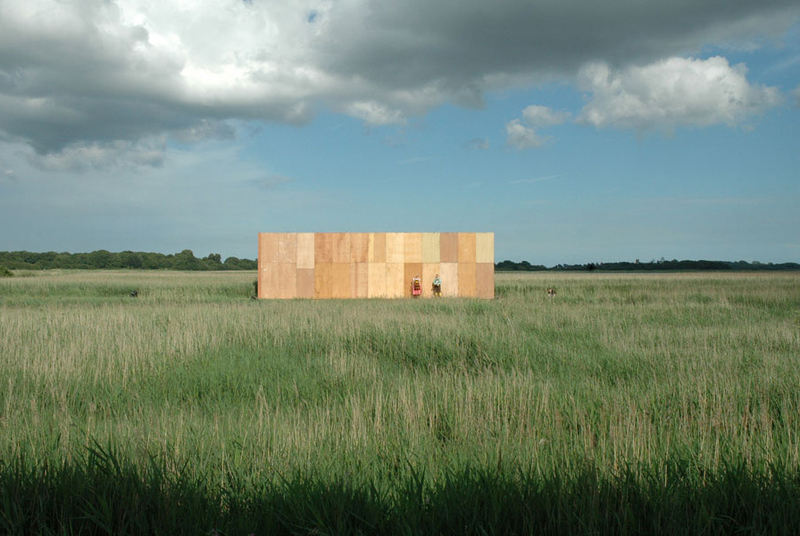 ‘Elephant & Castle’ (for music this time, not dance) is a series of installations set in the landscape of Snape Maltings in Suffolk, through which the audience walked to discover some powerful images, in this case exploring the Hansel and Gretel narrative. This is not to say that there isn’t plenty of theatrics to be found within this gutsy snapshot of UK design for performance. And if most of the shows I’ve cited feel a little polite, there is always Australian opera designer Paul Edward’s wonderfully rude and glossy image of ‘Bartered Bride’ for Staatstheater Darmstadt – an image that would send most fashion photographs in the vein of Tim Walker diving off the wall for safe cover. 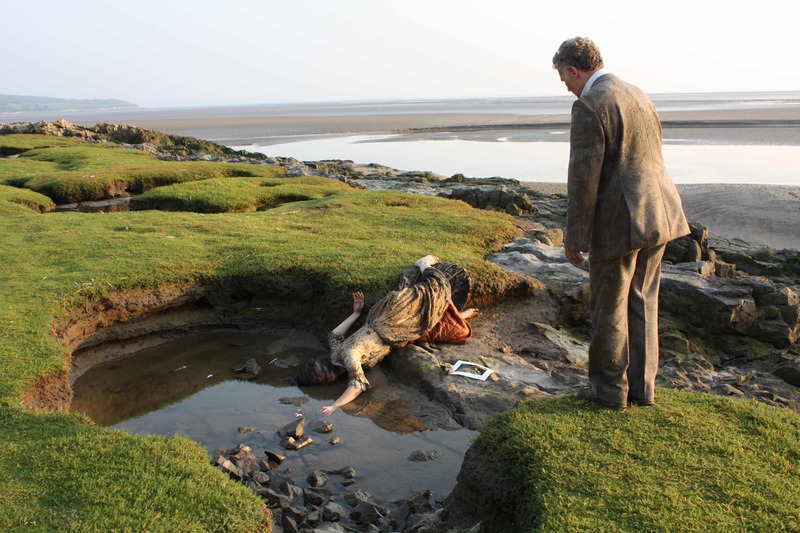 If the world of stage design has always seemed like a bit of a mystery, or if it seems like a treasure trove just waiting to be plundered, my advice would be to take the next train to Cardiff, just 2 hours from London, and go see for yourself. In June 2011, 12 exhibits from this exhibition of over 200 designs will form the UK’s representation at the ‘Prague Quadrennial of Performance Design and Space’ at Prague’s Museum of Modern Art; a broader selection of exhibits will also be exhibited at the V&A and the Baltic in 2012. The fully illustrated Transformation and Revelation catalogue with excellent prefaces on the art of design for performance by editors Peter Farley and Greer Crawley is available via Amazon. Dody Nash is a designer and artist working in opera, dance and public spaces. She is exhibiting ‘Swanhunter’ for Opera North at ‘Transformation and Revelation’.